After a thorough audition process, the Jazz Arts Group of Columbus (JAG) is pleased to announce trombonist Ryan Hamilton as a permanent member of the Columbus Jazz Orchestra. “We are fortunate to have yet another great talent in the CJO!,” shared Artistic Director Byron Stripling. 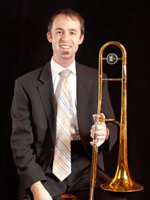 Ryan Hamilton is a versatile trombonist and educator, making music since the age of nine years old. His training began in fourth grade in Liverpool, New York and continued through high school in Columbus under the inspiring tutelage of Kie Watkins. While undergoing his collegiate studies, he joined the Glenn Miller Orchestra, playing trombone and singing in the vocal group, The Moonlight Serenaders. Upon finishing a two-year tour of the world he completed his degree at Capital University where he currently teaches in the jazz studies program. Darlings, New Basics Brass Band, Jesse Henry, and the Famous Jazz Orchestra. Kenyon College and Mount Vernon Nazarene University. esteemed and historic ensemble!,” expressed Ryan.